When it comes to Thailand, what is the first thing coming out your mind? Well, it could be the prosperous tourism, sacred buddha and spicy but tasty street food. Unsurprisingly, that is our stereotypical thoughts. However, there is one thing one often neglect — the potential to be a hot spot of E-Commerce in Southeast Asia. Although the development is not as advanced as Singapore and Malaysia, government has already allocated budget to invest in the infrastructure, hoping to transform domestic industries into unique specialities. In addition, with its strategic location, which refers to “One Belt and One Road” issued by China, the crosse border business is expected to grow by a significant number. Hence, the future of this religious country is promising and bright. Here, we choose Thailand as our fist stop to unveil the journey which will cover other five countries, presenting critical perspectives about the E-Commerce and Advertising. First, Thai shoppers have come up with a set of special online auction business. Unlike any countries in the world, the so-called “shadow marketplace” is quite common among sellers and buyers. The term implies that using Instagram as a platform to showcase their product and communicate with the seller via Line. 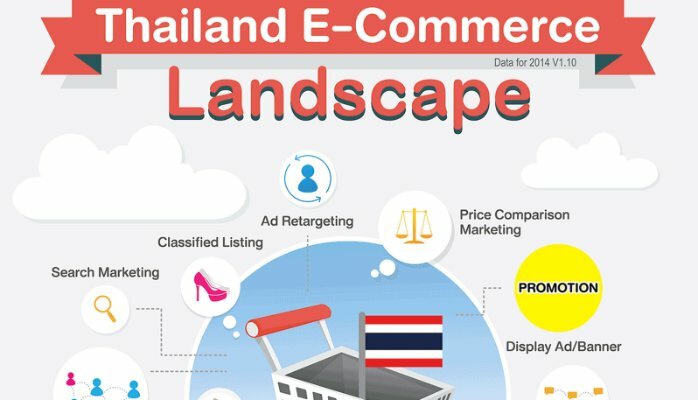 Thanks to emergence of social network and online communication app, there has been a rise of C2C e-commerce in Thailand, popping out an innovative and creative business model. Second, mobile devices are dominant but online sales are still made on desktop. As we concluded earlier in the article, (Weekly Column : Insights on Rakuten closedown in Southeast Asia), Southeast Asia is a region where people are accustomed to use cellphone to browse websites. However, this, by no means, is relevant to the shopping behavior. According to a statistics, 70% online shopper click the buying button on desktop rather than mobile devices. Although there is a higher rate in cellphone, one should contemplate into the meaning of numbers. Desktop still plays a critical assistant to market one’s product. Third, there are more and more cases of corporate cooperation, squeezing out player with little funding. Apart from international e-commerce players which have the backup from a bunch of investors, top three local players, TARAD.com, weloveshopping.com and sabuy.com, are all financially supported as well by corporations with huge amounts of capital. It’s inevitable that the environment become extremely rigorous than ever for new startups. Without perfect preparation, failure is expected to be very soon. Fourth, cash on delivery (COD) is the major and trusted way for payment. There are pros and cons with the development of internet. It brings the convenience for people but, on the other side, it may risk people’s trust at the same time. The fraud and spam are common in online shopping. As a result, even though there are excellent solutions for online shopping, such as third-party payment, fear for scam could still hover one’s mind. Fifth, traditional Ad-driven monetization do not work because of no-tail effect(see definition). Startups or Internet companies usually have a tendency to go with advertising as their default monetization strategy but not for ones in Southeast Asia. This can apply in Thailand without a doubt. Nowadays, companies often generate revenue by value added service. There is no space for traditional monetization channel to survive. Sixth, the logistics system remains a stumbling block for e-commerce. The product delivery in metropolitan areas has been improved greatly. However, when sending products between cities, the problems is still unsolved. This could be the cause by traffic congestion and lack of delivery service provider. Although DHL has made an investment and build a partnership with local logistics company(see the news : DHL eCommerce Launches Domestic Delivery Service in Thailand), the room for growth is believed to be a long way to overcome. Seventh, the demand for fresh food would gradually increase. Due to the changes of lifestyle in urban areas, people are becoming aware of body health. The consciousness makes them willing to afford better quality at a higher price. Previously, e-commerce players focused on fashion and cosmetics product but new players may shift to the new and unexploited business. In a nutshell, the competition in e-commerce is fierce. With the full support from government aiming to put emphasis on e-commerce, however, some of the adverse circumstances one meet would disappear within a short time. For next stop, we are going to have a trip in Malaysia. Please stay tuned in our Weekly Column!